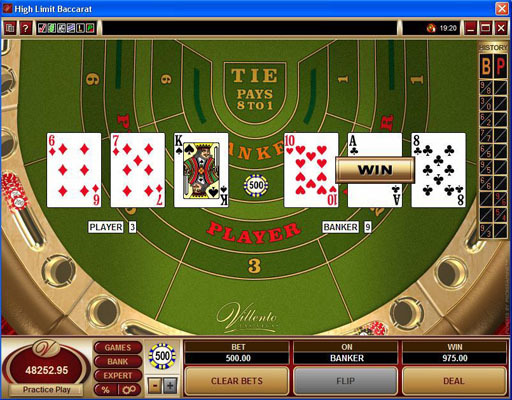 Baccarat is a common casino game that is available with nearly all online softwares. Bets on both player and banker have a similar chance of winning and a low house edge of just over 1%. Unfortunately the game rarely counts towards wagering at non-Microgaming bonuses because it is possible to simultaneously bet on both player and banker, greatly reducing variance. At the start of each hand, you may bet on the player winning, the banker winning, or a tie result. After you have placed your bet, both the player and banker are dealt 2 cards. Hands are ranked according to the right-most digit of their card sum. For example, a hand containing a 6 and 7 is valued as a 3. The card sum is 6+7=13, and the right-most digit of this sum is 3. The player or banker may be dealt a 3rd card according to the rules listed below. --If the player has a total of 0-5, the player draws a 3rd card. If the player has an initial total of 6 or 7, he stands. Note that the player must follow this strategy. He cannot choose to stand on a 4 or hit a 6. --The banker's play varies according to the player's total and 3rd card result. If the player did not draw a 3rd card, the banker draws if he has a total of 0-5. Otherwise, the banker draws according to the table listed below. Banker bets have a slightly greater chance of winning than player bets because of the improved banker strategy. To offset this advantage, banker bets have a 5% commission. Banker bets pay 0.95:1, while player bets pay 1:1. If you bet $100 on banker and win, you receive $195. if you bet $100 on player and win, you receive $200. Banker bets and player bets are returned, if the hand is a tie. Tie bets pay 8:1 and have a much higher house edge than player or banker bets. With such complicated rules, optimal strategy for baccarat is surprisingly simple. There are no strategy choices among which cards to take or whether to hit/stand. Place a bet on banker or player, then wait for the dealer to flip the cards, and see if you have won or not. Banker bets have a slightly lower house edge than player bets under typical circumstances, as explained below. Optimal strategy is to simply bet on banker. Under typical rules with 6 or 8 decks the house edge of the banker bet is 1.06%; the house edge of the player bet is 1.24%; and the house edge of the tie bet is over 14%. These standard rules are used by Playtech, Cryptologic, RTG (most), Chartwell, Boss, Rival, and most other softwares. Microgaming, Wagerworks, Grand Virtual, and Party Gaming offer single-deck baccarat, with a reduced house edge of 1.01% on the banker bet. 5Dimes Bonus Casino and Galewind Software offer games with a 4% commission on banker, resulting in a house edge of 0.60%. Betfair's Zero Lounge offers baccarat with a 2.75% commission on banker, reducing the house edge to 0.03%. House Edge values are listed in the table below. For checking other rule sets, see the baccarat house edge calc. RealTime Gaming casinos allow dealers to configure decks and rules, so some casinos use a modified payout from above. RTG casinos round down the commission on banker bets the nearest 0.25. This rule increases the commission to beyond 5% and increases the house edge, if your banker bet is not a multiple of $5. If you are not betting a multiple of $5, then the player bet likely has a lower house edge than banker. Some Chartwell casinos offer a "No Commission" baccarat game where the banker bet pays 1:1 on non-8 wins and 1:2 on 8 wins. This change increases the house edge to 4.07% on the banker bet, making the player bet far superior (player bet is unchanged). The standard deviation per hand of baccarat is ~0.93, lower than blackjack and slightly below roulette. The low variance relates to a maximum payout of 1:1 and a small portion of the hands being pushes. The table below shows the chance of ending above the deposit balance with unlimited bankroll, after completing a wagering requirement with 5 bet sizes. Standard rules and a 1.06% house edge are assumed. See the return & variance calculator for more specific estimates. Copyright © 2008-2014 www.beatingbonuses.com All Rights Reserved.